Although most people think of expert styling and premium comfort features when they think of the Mazda MX-5 Miata RF, the vehicle also shines when it comes to performance capabilities. This popular hardtop convertible has everything that you need to get you through the streets in style and with ease. 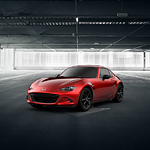 Miata will make driving fun again with this car's six-speed manual transmission. The compact and light size delivers a precision that driving enthusiasts will appreciate. This innovative transmission is equipped to provide an effortless drive regardless of the road conditions. The incredibly light MX-5 Miata RF is engineered to boast an agile driving experience every time you step inside the luxurious cabin. The aluminum power plant frame is now almost 20 percent lighter than the previous-generation MX-5 Miata. This lightweight construction translates to a more responsive driving experience, providing joy and exhilaration at every turn of the road.